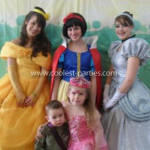 We have boy/girl twins who were turning eight and wanted a party that would accommodate all their friends and ideas. So, we took the book series “The Magic Tree House” that all the kids are reading and used this as inspiration. It was a rainy day, so we had to stay indoors. We made a “Magic Tree house” in the garage. We had a fan and strobe light to blink as they traveled to each different time warp. Then, the kids were given a backpack to collect their loot. We started with Dinosaurs Before Dark book, where the kids had to pop the dinosaur egg (balloon) filled with a baby. When they found the baby, a prize was awarded. Back to the magic treehouse, the winds blew and out they came to Hour of Olympics where they had the javelin toss (straws) and the chariot race (wheelbarrow races with kids). Prizes were Olympic medals. Back to the magic treehouse, winds blew and they arrived at Stagefright on Summernight. 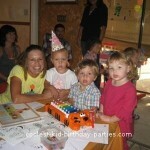 The birthday kids were the king and queen and the guests donned the jester’s hat and had to make them giggle! The prize was a crown jewel – ring pop. Back to the magic tree house, winds blew etc and returned to High Tide on Hawaii. 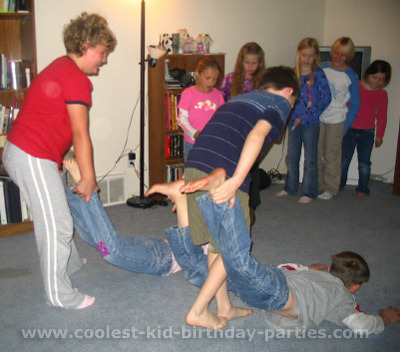 We played musical islands (musical chairs). Back to the final magic tree house adventure; Vacation under the Volcano. 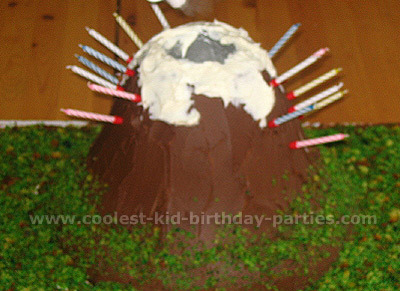 This was time for our volcanic birthday cake and the regular party fun! 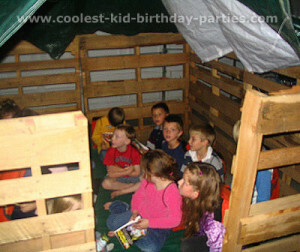 It turned out so cute and the kids all had a blast! !